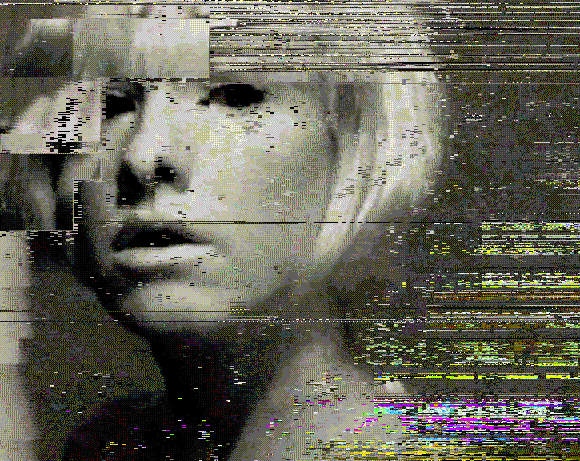 Rosa Menkman (NL) re-imagines her digital self; part of the visual lineup for In/Out in New York next week. What is essential or new to the craft of fabricating electronic music? Who are we, today, as digital artists? As a certain natural sameness descends on some computer-based music performance as the medium matures, artists at gatherings like next week’s In/Out Festival push out toward the fringe. And like the shifting pixels in Rosa Menkman’s imagery, these events indicate an emerging – sometimes glitchy – self-image of a scene. In/Out hits New York Friday, September 17 – Saturday, September 18. The workshops on offer attack convention head-on. Sarah and Lara Grant make their circuits out of felt, crocheted sensors, and other fuzzy, furry, soft things. Rosa Menkman, above, turns file formats themselves into a medium. (Rosa’s workshop description alone might blow your mind.) Philip Stearns makes digital circuits from the most basic of elements. You can attend the festival for US$15-25 if you’re in the New York Area. Disclosure: I’m one of the artists playing. But don’t let that stop you. 😉 Workshops and talks are mostly free. But if you’re hiding out in New York on this 9/11 weekend or anywhere in the world, here’s a brief audiovisual portrait of this gathering of boys and girls and their work, as well as a crackling, humming track from Protofuse (France) for CDM readers, for play or WAV download via SoundCloud. And wherever you are, they offer an opportunity for audiovisual reflection. Jeff Thompson (NYC) makes a cascade a lovely sounds, lit by flashlights, in a Texas Firehouse performance. Check out his collection of contact mics. Music for Cooking: Eggs from Stephen McLeod on Vimeo. CV Gate Control – Drum Triggers – In/Out Fest 2010 from Jred Smyth on Vimeo. Chromatic Textures from Unearthed Music on Vimeo. mtn live @ music ecology Boston Part III from makingthenoise on Vimeo. …to one main entirely of felt. (See Lara Grant’s thesis blog for technical details, or Rhizome for a studio visit with sisters and makers Sarah and Lara.) It’s difficult to read online, but these things are absurdly fun to play. 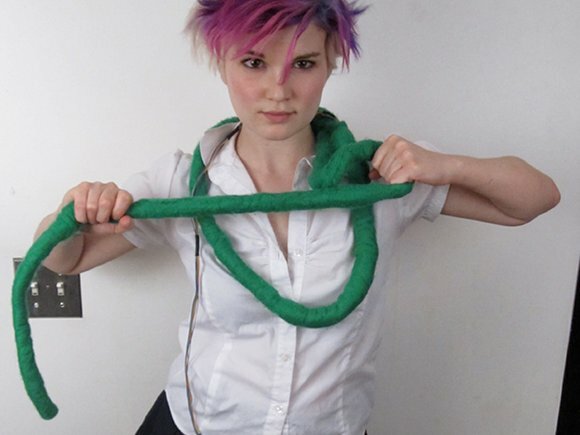 This is, in fact, not creator Lara Grant, but our friend Lindsey Marcelle Case modeling, because felt sensor snakes are what we’ll all be wearing this time next year! More at Felt Signal Processing. protofuse at Apero Codelab #8 fest from Julien Bayle on Vimeo. And stay tuned for more artist goodness and how-to’s right here.